Abstract: Using the right mouse (read comfortable) for long stretches at the computer can help alleviate hand cramping, and other unpleasant side effects of the dot com world. There aren't many of us out there who can really, and I mean really, justify buying a $80 CDN mouse. For any mouse that is a heck of a lot of money, especially if you think about all those white box computer retailers who get their mice-keyboard combos from the distributor for $10 - total. So what would anyone in their right mind have to do with a super-expensive, metallic blue glowing optical mouse? Two words, comfort and reliability. There is a growing number of us who work on computers all day, and sometimes all night. Using the ergonomic gear is not just a sign of forward thinking, but of necessity. Jump a head 30 years and tunnel carpal syndrome will probably be more common then lung cancer!! Putting that thought aside for the moment, having the right mouse (read comfortable) for long stretches at the computer can help alleviate hand cramping, and other unpleasant side effects of the dot com world. If you've ever tried to clean a mouse ball then you instantly understand the convenience of the optical system. That's not to say optical mice are totally infallible, I've seen my share of dead optical mice around here. After all, if the mouse ball can't kill the mouse, the buttons and rolly-wheel sure can. 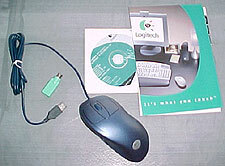 The Logitech Mouseman Wheel comes with a CD-ROM full of drives, some very brief instructions and a USB-to-PS/2 adapter. The mouse is of the four-button variety. 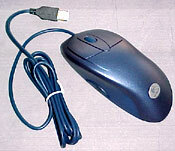 Installing the mouse is as simple as plugging it in, turning on the computer and dropping in the CD-ROM when prompted. If you don't have a USB port on your computer, or one that is available, the adapter will come in quite handy. The optical mouse works by reflecting a red light off the surface the mouse rests on. A very small optical device picks up the reflection of that light and uses the information to calculate where the mouse is moving and how fast. All this is done rather quickly, and there really is no difference except for the lack of the mouse ball. Skipping mouse balls are among the most annoying of all problems - next to keyboards with broken keys. When that mouse ball skips it just slows things down, and can be very frustrating, especially when working in programs like PhotoShop. All in all the mouse is a very comfortable device that fits easily in any right-handed persons hand. Lefties are just plain out of luck with this mouse. The rolly-wheel has a nice amount of resistance, and like all Logitech mice I've seen in the past the buttons are nice and fast, and don't stick. On the downside, this is one expensive bit of computer hardware, but if you work more than 10 hours a day on the computer it's surely worth while in the long run.